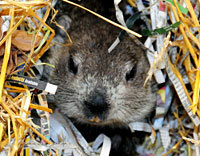 Join Us for Ground Hog Day! 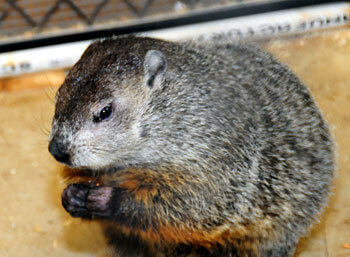 The Milwaukee County Zoo’s resident ground hog, Wynter, will take center stage in the annual weather prediction festivities on Ground Hog Day, Saturday, February 2 at 10:30 a.m. at the Zoo’s Northwestern Mutual Family Farm. Wynter is a 5-year-old female (her estimated birth date is April 2008), who arrived at the Zoo from the Boonshoft Museum of Discovery in Dayton, Ohio. A rehabilitated animal, Wynter was found orphaned on a roadside at approximately five weeks of age. At the Boonshoft Museum of Discovery, Wynter served as an educational animal for the museum’s hands-on learning activities offered for children. The public is invited to join Wynter as she takes the spotlight and makes her prediction. According to tradition, if it’s sunny and Wynter sees her shadow, she’ll return to her burrow for six more weeks of winter. If she does not see her shadow, we can expect an early spring. For more information, please call the Zoo’s Public Affairs Office at 414.256.5466.